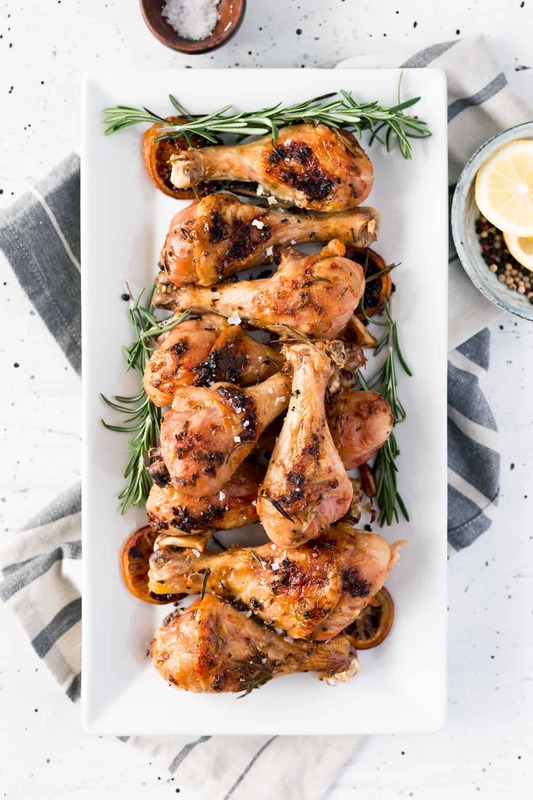 Simple Oven Roasted Chicken Drumsticks made with butter, garlic, herbs, and more. This simple dish will be on the table in 40 minutes or less! You all know how I feel about simple, family-friendly dinners that aren’t fussy. I LOVE them. I mean, I have five kids and a life. Sure I love to cook but that doesn’t mean that I don’t ever struggle getting dinner on the table for my people. 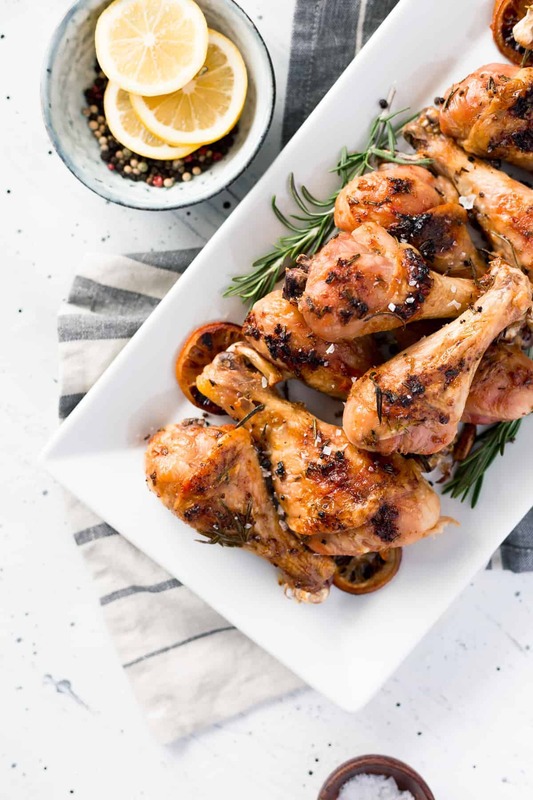 One thing we all love is a great roasted chicken recipe and this particular recipe is a keeper; I can’t wait for you to try it, too. 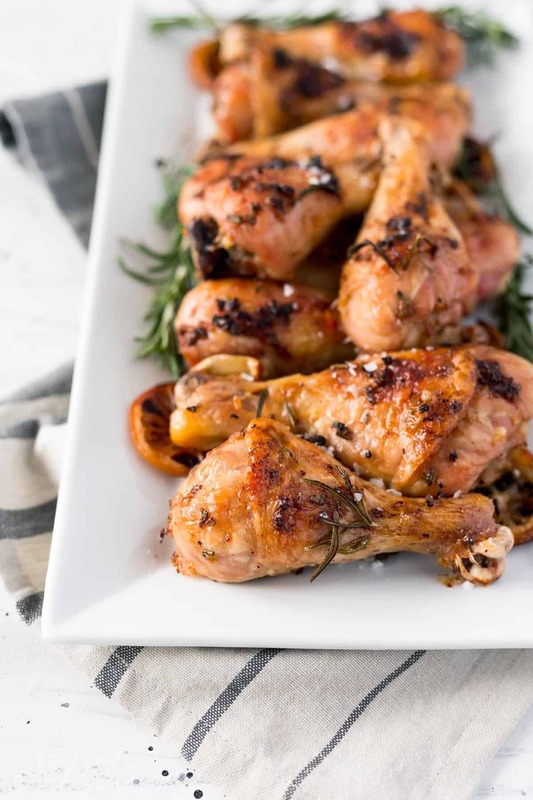 This roasted chicken recipe is super simple. It has things like garlic, rosemary, and lemon in it, but what’s great about it is that none of those are the star of the show. They all work together to produce a really flavorful chicken without any one ingredient really standing out too much. 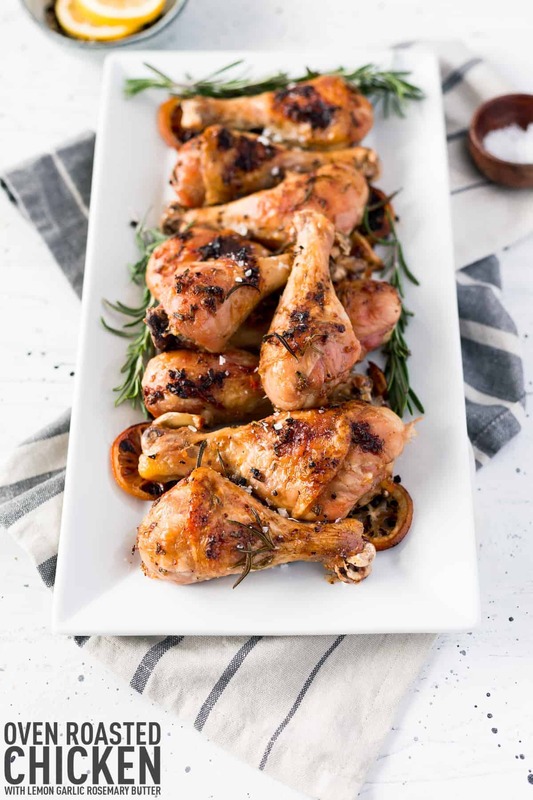 This is one of those basic chicken recipes that you are going to come back to again and again because it’s simple, it turns out every time, your kids will love it, and it’s a great main dish to serve with your favorite sides. It kind of goes with anything and everything (I made notes on side dishes I’d serve this with in the Tips and Tricks section). I feel like the little trick to this recipe is that you add your garlic and lemons to the pan with the chicken and then add some broth to the pan. The chicken and all of the “aromatics” mingle more because they are in a liquid and the chicken stays more moist. The liquid cooks off and you are left with the most delicious chicken in the end. This simple oven roasted chicken is going to be a stable in your kitchen. 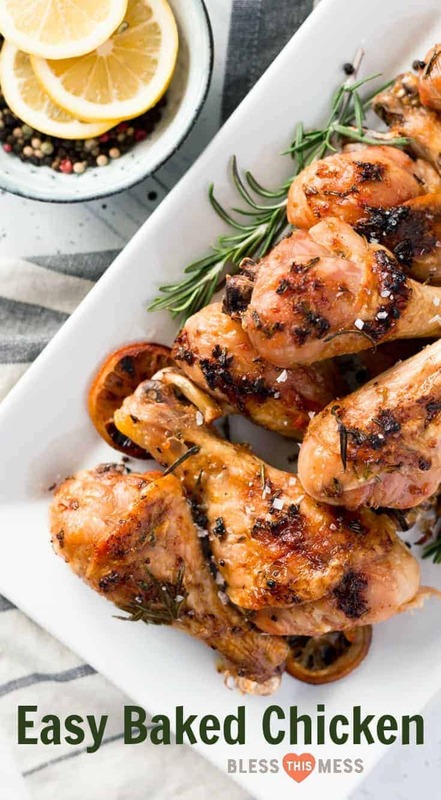 Chicken drumsticks are a great option for this recipe but you can also use bone-in, skin-on chicken thighs or chicken leg quarters. You just need to adjust the cooking time as needed. Using a thermometer will help ensure the chicken is cooked through (without overcooking). Adding aromatics like the garlic and lemon slices and a little chicken broth to the pan helps to make the chicken extra flavorful and moist. You are going to love this little trick. Don’t forget to line your baking sheet with parchment or a baking mat; makes clean up so much faster. You can serve this with all kinds of things like easy Santa Fe Rice and a side of spinach and berry salad. It would also be great with my favorite Pioneer Woman Potatoes au Gratin, any of these 8 pasta salad recipes, or baked potatoes. In a small bowl, mash together the softened butter, minced garlic, lemon zest, and rosemary. Pat dry the drumsticks, then rub half of the butter mixture under the skin of each drumstick and the remaining butter mixture over the top of the skin. Season generously with salt and pepper. Line the drumsticks on the lined baking sheet, leaving a couple inches between drumstick. Lay the lemon slices throughout the baking sheet, followed by the onion, then the halved garlic head. 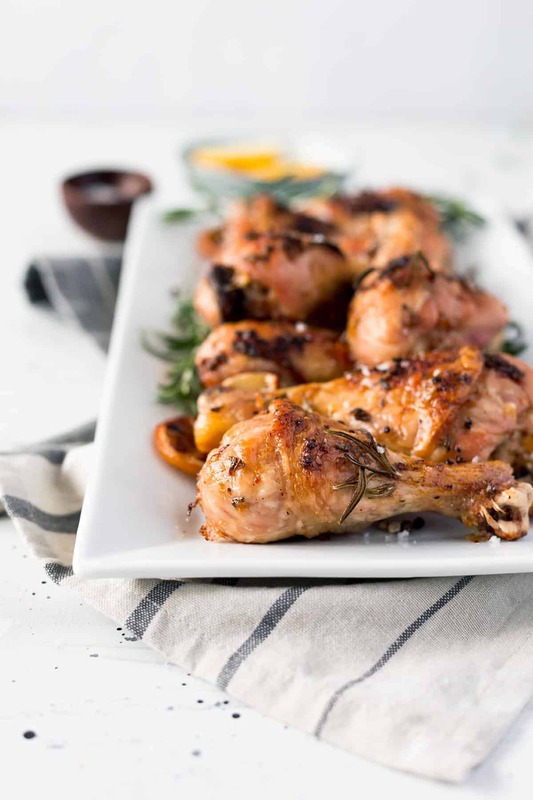 Carefully add the chicken broth to the bottom of the pan and place in the oven to roast for 30 minutes, or until an instant-read thermometer inserted in the thickest portion of the drumstick registers 165 degrees and juices are running clear. Serve immediately. So simple, so delicious, so easy. You’re making this tonight, right?! Enjoy from my kitchen to yours! This post was originally published in February 2010 and has been updated, revised, and rephotographed in February 2018. I love dark meat!!! Yummy in General Tso’s chicken! Buy low had it for boneless/skinless for 89 cents/lb and I can’t wait for that sale to happen again!! That looks yummy! 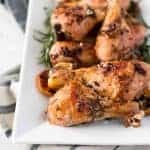 I’ve found a few good recipes for chicken thighs since I can get them for such a good deal sometimes.